Kahwa is known for being an elixir when it comes to winter. The brew not only has a very sweet smell but also helps in keeping the body warm. And surprisingly enough, we found Kashmiri Kitchen in DLF Phase 4 to supply us with kahwa for this winter. The restaurant located near IFFCO Chowk is tiny and you may have to search a little for it. But once you do, its warm ambience will make you feel comfortable. It’s actually a great place to visit on winter evenings when you want to find a quiet corner to just read a book while sipping your kahwa. The kahwa here has the aroma of cinnamon, cardamom and saffron. The generous amount of dry fruits and the rich flavour it provides to the brew is what will keep you coming back to this place. And the amount it’ll set you back by? Only INR 50! 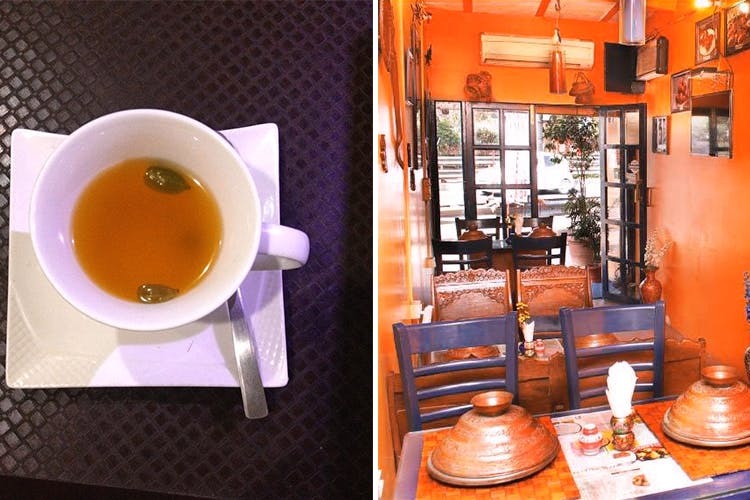 If you’ve been looking for authentic Kashmiri kahwa that will warm you up and also a soothing ambience, you need to visit Kashmiri Kitchen in DLF Phase 4. If you go here expecting a fancy ambience, you will be disappointed. But if good kahwa is what you want, make a plan soon.